A Texas judge has awarded the Houston SPCA permanent custody of 207 horses at the center of a welfare case. District Judge Michael Seiler made the ruling last Thursday in respect of horses removed from a property in Conroe, Texas. They were taken into the charity’s care on June 25. A Justice of the Peace had awarded custody of the animals to the SPCA late in June, but the owners, Herman and Kathleen Hoffman, appealed that decision. 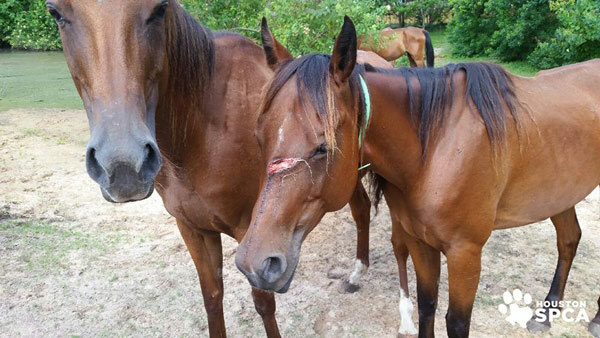 “We are pleased that the judge has reached the same decision in the appeal that was reached in the civil hearing on June 30 when Montgomery County Justice of the Peace Pct 1 Wayne Mack found the horses had been cruelly treated,” Houston SPCA president Patricia Mercer said. “We are thrilled to be able to continue our tireless rehabilitation efforts. However, the costs of the operation are mounting. For some horses, the road to recovery will be long. The SPCA said costs in caring for the horses, known as the Conroe 200, had already comfortably surpassed $US400,000. The judge ordered the Hoffmans to pay $US485,000 in care costs for the animals. The Hoffmans face misdemeanor animal cruelty charges. The trial is set for early November. Support the Houston SPCA here. The charity’s wishlist for required items is here.